Inspecting heat sealed packages - Specim, Spectral Imaging Ltd.
Airtight packages preserve the product’s freshness, improve quality and prevent leaks. It is essential to ensure that the package is reliably sealed, and this sets requirements for seal inspection process. Good seals can only be made on clean material: any contamination between the seal and the package is no longer airtight. As a result, air and contaminants such as molds, fungus or bacteria can enter the package and ruin the product well before the expiration date. It is crucial that the incomplete seams and leaking packages are found already on the production line. Yet conventional vision systems do not work when inspecting the heat-sealed packages for leaks, in particular if the package is made of printed plastic. Hyperspectral imaging is the only imaging method that reliably finds the imperfect seals through the sealing film, even when the package is printed. This has been tested and confirmed by Minebea Intec, a leading manufacturer of industrial weighing and inspection technologies, and Bergader Privatkäserei, a specialty cheese manufacturer. When the Bergader Edelpilz blue cheese got a new package, the seal inspection process faced a completely new challenge: the old equipment could not see the cheese crumbs breaking the heat sealing through the printed plastic. To avoid the disadvantages of manual inspection, Minebea Intec started looking for a suitable machine vision technology that could be used for seal inspections. They first tried an X-ray system, but soon found out that would not work: “With this system, we couldn’t detect faults in the heat-sealed joints with 100% reliability”, says Markus Leibold, account manager of Bergader and regional sales manager for Minebea Intec. At this point, Minebea Intec turned to STEMMER IMAGING for help and they suggested testing the heat seal inspection on-site using hyperspectral imaging technology. 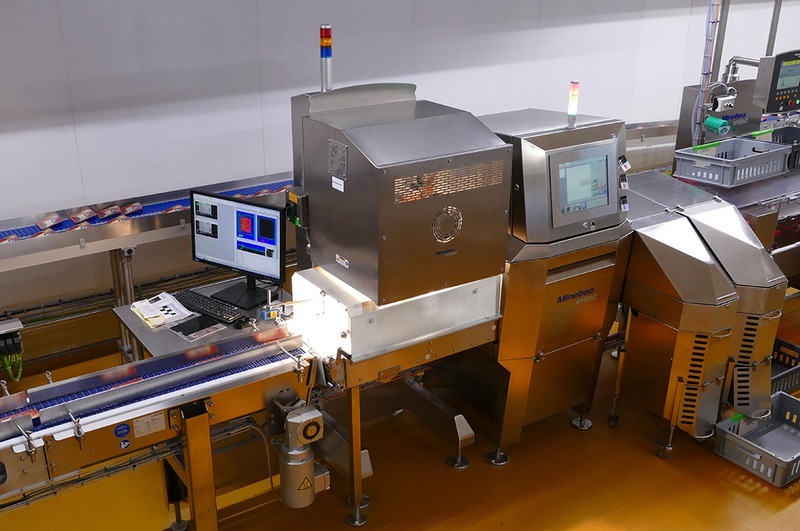 Together STEMMER IMAGING and Minebea Intec development team conceived the first seal inspection system for the heat-sealed packages that relied on hyperspectral analysis. The results were very promising from the very beginning and quickly confirmed that this technology is perfectly suited to this application. On-site tests used a vision system based on a Specim FX17 hyperspectral camera. “The results were very promising from the very beginning and quickly confirmed that this technology is perfectly suited to this application”, says Manuel Pichler, an engineer responsible for the technical planning of a new production line at Bergader. 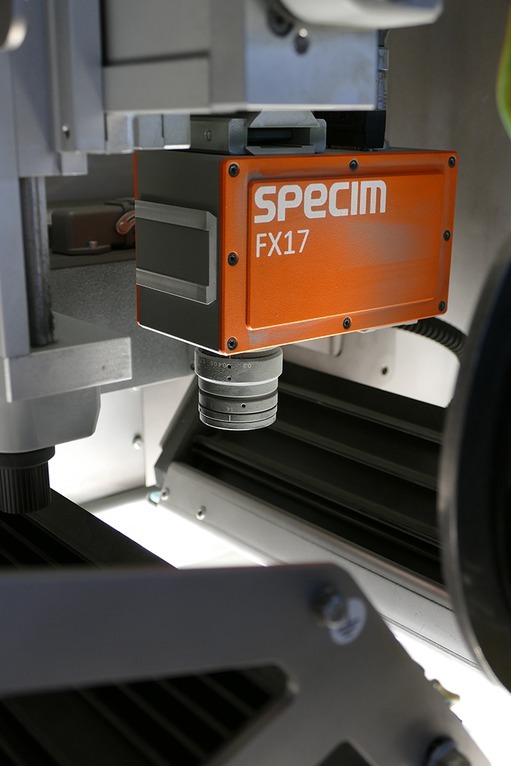 The particular strength of Specim FX17 is it’s spectral resolution: with the aid of the transmission properties of long-wave light, contamination of the heat-sealed joint by cheese crumbs or other foreign bodies can be reliably detected even through printed plastic films. The particular strength of these hyperspectral systems is their spectral resolution: with the aid of the transmission properties of long-wave light, contamination of the heat-sealed packages can be reliably detected even through printed plastic films. The prerequisite for this is that the covering plastic material is transparent to light in the SWIR range. The seal inspection at Bergader thus represents a perfect application case: imperfections or undesirable substances are reliably identified through the sealing film. Minebea uses Specim FX17 as a part of a larger system that also includes lighting, data acquisition equipment, analysis software, and other, more traditional imaging systems. Hyperspectral imaging equipment can be integrated into other inspection methods, and, as a result, it provides results that cannot be achieved with any other method. Meet us at booth 1H11 in Stuttgart.